The Global Volcanism Program has no activity reports for Devils Desk. The Global Volcanism Program has no Weekly Reports available for Devils Desk. The Global Volcanism Program has no Bulletin Reports available for Devils Desk. The Global Volcanism Program has no synonyms or subfeatures listed for Devils Desk. Devils Desk, which rises 450 m above the top of Hook Glacier to its west, is the eroded neck of a former stratovolcano, most of which has been removed by extensive erosion. Three radial dikes exposed as ridges extend from the volcano toward the east. Devils Desk lies at the NE end of a glacier-mantled range containing small closely spaced volcanic centers that extends from Snowy Mountain, NE of Mount Katmai. The age of Devils Desk volcano is not known precisely. 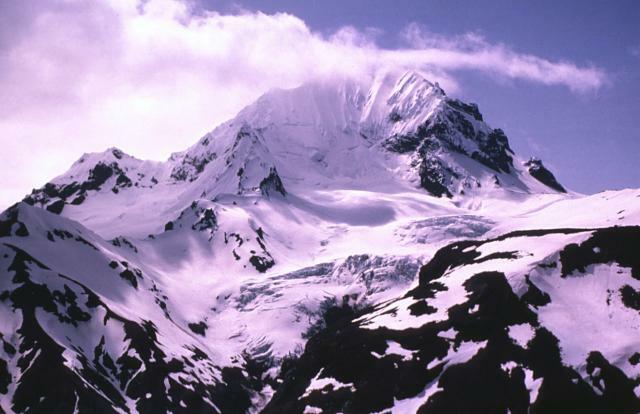 Although it was included in a list of probable Holocene volcanoes (Smith et al., 1978), extensive glacial dissection suggests it could be of Pleistocene age (Motyka et al., 1993), and Hildreth et al. (2003) obtained a Potassium-Argon date of about 245,000 years from a block on the SW face, similar to the age of one of the nearby rear-arc Savonoski cones. The Global Volcanism Program is not aware of any Holocene eruptions from Devils Desk. If this volcano has had large eruptions (VEI >= 4) prior to 10,000 years ago, information might be found on the Devils Desk page in the LaMEVE (Large Magnitude Explosive Volcanic Eruptions) database, a part of the Volcano Global Risk Identification and Analysis Project (VOGRIPA). There is no Deformation History data available for Devils Desk. There is no Emissions History data available for Devils Desk. The Global Volcanism Program has no photographs available for Devils Desk. There are no samples for Devils Desk in the Smithsonian's NMNH Department of Mineral Sciences Rock and Ore collection. IRIS seismic stations/networks Incorporated Research Institutions for Seismology (IRIS) Data Services map showing the location of seismic stations from all available networks (permanent or temporary) within a radius of 0.18° (about 20 km at mid-latitudes) from the given location of Devils Desk. Users can customize a variety of filters and options in the left panel. Note that if there are no stations are known the map will default to show the entire world with a "No data matched request" error notice. Large Eruptions of Devils Desk Information about large Quaternary eruptions (VEI >= 4) is cataloged in the Large Magnitude Explosive Volcanic Eruptions (LaMEVE) database of the Volcano Global Risk Identification and Analysis Project (VOGRIPA).